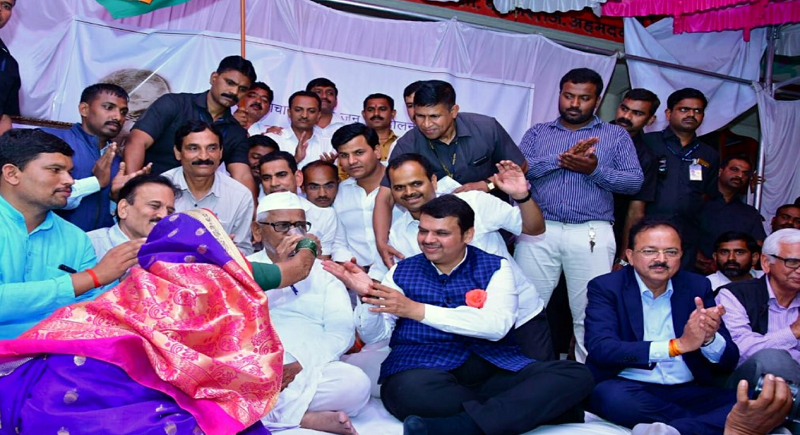 Ahmednagar, February 6: Citing the 7th day of the hunger strike, social activist Anna Hazare culminated the fast after the long talks with the Maharashtra CM Devendra Fadnavis and Union Minister Radha Mohan Singh. The state government has accepted on Tuesday the demands over the Lokpal and Lokayukta after marathon discussion on the issues in presence of Subhash Bhamre and Girish Mahajan at Ralegan Siddhi. On the demand of Lokayukta the state government has come up with a Joint drafting committee to be constituted with the representatives from Government and other organisations. Fadnavis however proposed bill to be tabled in next full Budget session of Maharashtra legislature. Meanwhile on the demand of Lokpal, the Union Government has already cleared their stand in the Supreme Court and as per the stand, search committees are set to meet on 13th of February 2019. Citing the agriculture price commission and other agriculture related demands, a committee will be formed under Union Minister Radhamohan and recommendations will be submitted by October 19. Noted agriculturist Sompal Shastri will be representing Anna Hazare in this committee, added the statement. “Anna was on the strike past six days, demanding Lokpal and lokayukta and remedies on agrarian issues. Some of his demands were already accepted and approved by the state, and now the others have also been accepted. The SC has ordered the procedure for Lokpal, which will be followed. Further he demanded to raise the amount from Rs 6000 to more of the PM Kisan Nidhi Yojana, which was recently announced in the budget. Regarding this we assure that the state will be contributing to the extent possible. The Centre is also prepared to increased the said amount after the discourse”, said CM Devendra Fadnavis. “The Government has accepted the demands and the committee will be hearing on 13th of February citing Lok Pal and a Jojnt drafting committee has been scheduled to be set up soon for Lokayukta. This Lokayukta of the state will be heading to serve the nation as well, similar to that of RTI. RTI was first set in Maharashtra and later undertaken by the nation. I am satisfied by the state’s move and therefore terminating the hunger strike”, activist Anna confirmed.